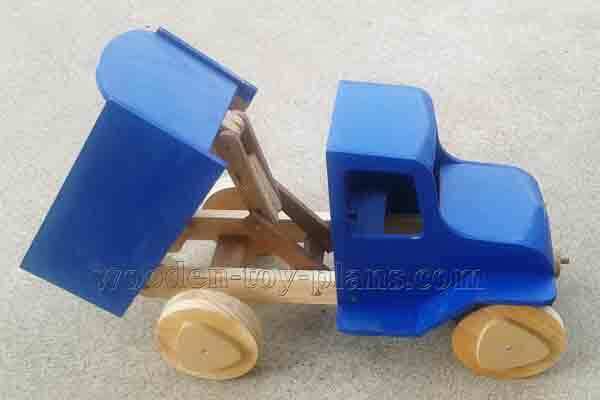 These free toy truck plans are designed to be as simple as possible, using standard wood stock available at most hardware stores. Making toys for children of all ages is a very rewarding pastime. Making wooden toys for your family or special friends are more appreciated than anything that you can buy in a shop. It will always have a special significance to your children and grandchildren, because this was something that Dad or Grandad made. 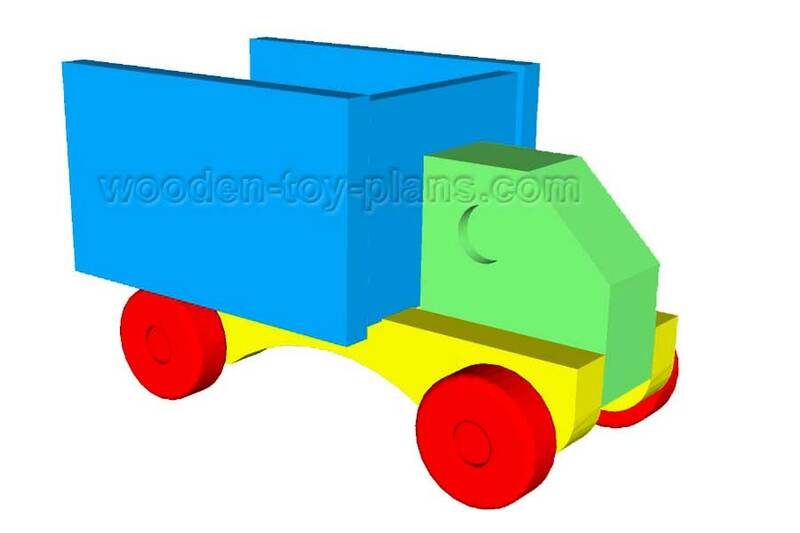 These toy truck plans are offered free of charge, no obligations, under the creative commons licence. You can sell the toys you have made from these plans because they are your own creation. In fact I encourage you to do just that. Could there possibly be a better gift than such a toy made specially for your children or grandchildren? Even nephews and nieces would appreciate your efforts. 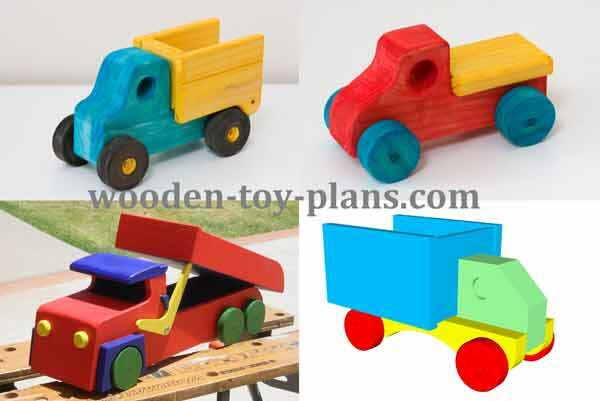 Part of the attraction of wooden toys is in fact the lack of detail that stimulates the child's imagination. Tipper trucks, sometimes called dump trucks, are popular with young engineers, because not only can they carry loads, they can also offload cement, concrete or sand, and remove rubble from the building site and dump it elsewhere. This set of free plans come in a range of sizes, from the large lever operated vingtage toy truck measuring 18 inches long and 6 inches wide. 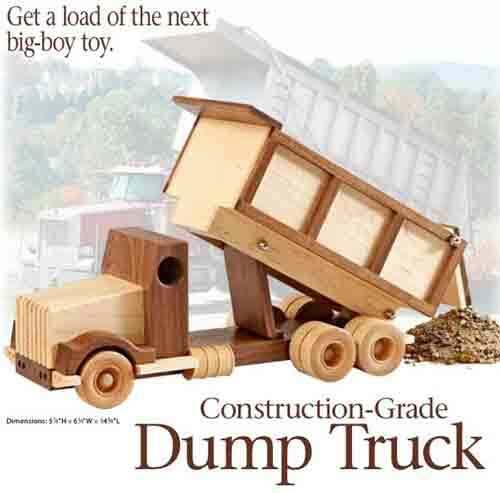 The mid size dump truck at a little over half size at 9 inches long and 4.5 inches wide. The smallest of the three comes in at 4.5 inches long and only 3.5 inches wide is designed to get in and out of tight spaces. 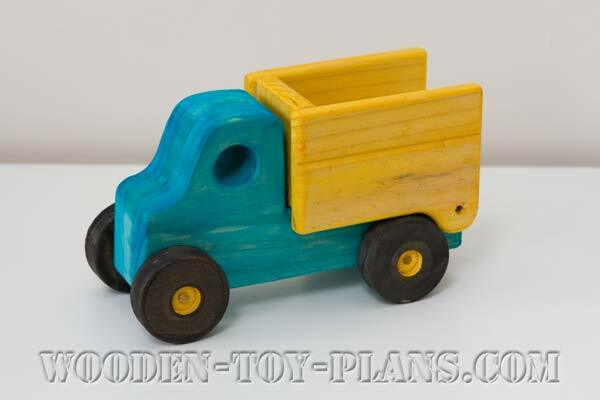 Free wooden toy truck patterns for toy dump truck Mk1 which measures almost 18 inches long and a bit more than 6 inches wide. Made from half inch stock, it is light but sturdy. Features full size patterns and step by step instructions with photos. Toy dump truck plan Mk2 is about the same size, measuring about 235mm [9.3 in.] long, 145mm [5.75 in.] high and 115mm [4.5 in. ] wide. Toy tipper truck plan Mk3 measures 250mm [10 in.] long by 115mm [4.5 in.] high and 90mm [3.5 in.] wide. 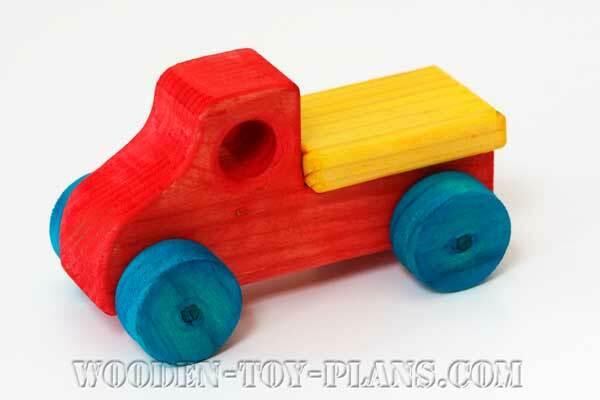 Wooden toy truck plans Mk4. Don't be fooled by it's diminutive size. This super micro truck can certainly hold it's own. For starters, it can get to places where other trucks fear to go. Brand new hot off the press just in time for Christmas. This unique winch operated toy dump truck, easy to build with basic hand tools and stock timber. More plans to build toy trucks for sale at very reasonable cost. Some plans are offered as downloadable PDF, others are full size paper plans. Forums are a great place to meet and discuss your wooden toy projects. 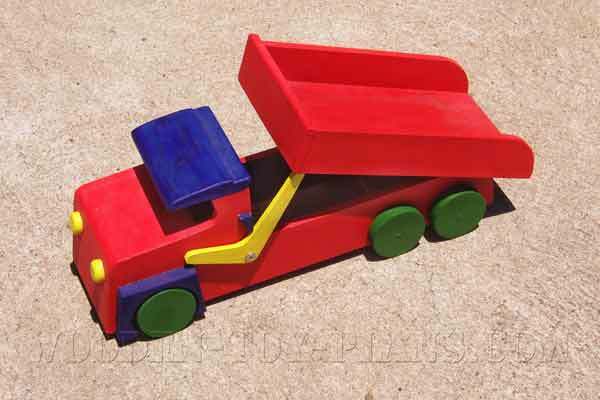 For this toy dump truck, I made my own wheels using a circle cutter mounted in a drill press. It may be easier to buy ready made toy wheels. from Ebay. Includes wagon wheels, spoked wheels and wheels with treads. Click below to see what other woodworkers have made.